The Happy Meal, and its included toy, is one of the more brilliant marketing schemes of the past 30+ years. 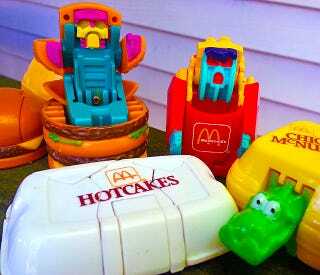 It ensured that every child in the country was begging their parents to take them to McDonald’s, especially when in 1987 the chain introduced Changeables: its own line of transforming toys based on the restaurant’s actual food. If you were to pitch someone in the toy industry a line of robots that transformed into food, instead of race cars or fighter jets, they’d almost certainly laugh you out of the room. But when that food is actually McDonald’s Big Mac or its iconic french fries, somehow those transforming robots end up being one of the most popular and collectible Happy Meal toys ever released.